Review of The Eight Sleep Tracker - Is It Worth the Price? The Eight Sleep tracker is easy to set up since it fits your mattress like a mattress cover. It's smart home integrated so that it can connect to many of your home devices, so you can control your lights and much more directly from your phone. Aside from everything it tracks while you sleep, I find the best feature this tracker offers is its bed warming capabilities—which comes with 10 heat levels to choose from. While the tracker comes with lots of beneficial features, it does have some issues you should be aware—keep reading below to learn more. Now, let's take a comprehensive look at the Eight Sleep Tracker—the good and the bad! How Accurate is Eight Sleep Tracker? Before getting into specifics, lets briefly talk about how the Eight Sleep tracker works. This tracker looks like your average mattress cover, but with the added benefits of tracking your sleep, bed and room temperature, heart rate, room humidity, breathing rate, and noise levels around you. It also uses IFTTT for optimal device compatibility, comes with an easy to use app, and provides lots of additional features that can make or break your final decision. The Eight brand has managed to implement innovative tech that is designed to simplify your life into their sleep tracking products. The Eight Sleep tracker featured here, specifically, has a heating feature that will warm your bed to your presence. Before going over the Pros and Cons of this feature, it is important to note that while the Eight Sleep Tracker can warm your bed, it does not provide any cooling features or settings to choose from. As far as heating, this tracker can warm either side of your bed—so if there are two of you, you can choose to apply this feature to either one side or both sides of the bed. It also allows you to apply different heat settings (with 10 levels to choose from) to each side, so you can customize it to your own liking. One of the best parts would be the ability to set an automatic on/off schedule through the app—which you can connect to via IFTTT. While the warming feature will keep you cozy and comfortable during the night, there are some issues that you need to consider before moving forward and selecting this product for your home. The biggest downsides are that you can only turn the heat off from the app and that the app doesn't store any of your timer settings. So, if you want to turn the heat off or change the heat settings, you'll need to find your phone first, and if you want a consistent on/off schedule, you'll have to remember to reset it every night. Keep in mind that 10 hours is the default setting, so this means you'll have to change this every night if you don't want to keep it on that long. Overall, the heating feature is a great addition that many of you will find useful—but the company does have several things to work on if they want to make it more effective and efficient. If you don't mind having to reach for your phone every day to set it to your preference, this may be a great fit for you. The Eight Track sleep tracker features smart home integration, which allows you to connect it to almost any device in your home—thanks to the use of IFTTT. It is also compatible with Alexa, so if you have one in your home, you might find the Eight Sleep tracker particularly useful. The Eight Track app, which can be accessed through your preferred device, will not only allow you to have your bed nice and warm long before you get in it, but it can also be programmed to automatically control some of the other devices in your home—so you can use it to turn your lights on/off, lock your doors, and even get your coffee going for you first thing in the morning! Aside from that, the app offers many additional on its own—so if you need a smart alarm to wake you up bright and early, sound “machine” to help you fall asleep, or even a meditation series, then the app has got you covered. While all these features mentioned above come in handy, it's essential to go over some of the flaws that come along with them. The biggest, and most complained about, issue so far is its unreliable Wi-Fi connection—this is frustrating given that almost all the extra features require Wi-Fi to function. Users say the connection can be resolved by unplugging and re-plugging the Eight tracker—but it can be incredibly frustrating to have to do that every time you want to do something quickly. Overall the Eight Track sleep tracker is designed for optimal home integration, but it has a few things the company needs to work out. The Smart Alarm is one of the best features, but it could use more day and time customization options. The Eight sleep tracker looks like your typical mattress cover, and you can get it for full, queen, king, and California king mattresses. Your purchase will come with the cover for the mattress, hub, and manuals for you to refer to—so you can figure out how to make match your comfort needs. As far as comfort, many users report it does not provide any additional comfort, while others say it causes them further discomfort at night. 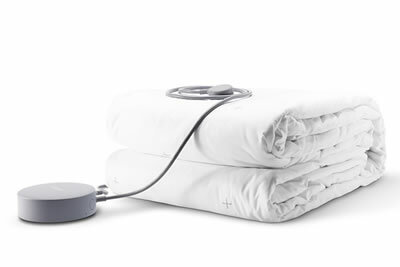 The mattress cover is stiff, and some users report the hub placement bothers them—although many people don't find the sensors to be bothersome. When it comes to fit there aren't too many complaints—although users with thinner mattress find it to be a bit too large for their bed, which is bothersome. The Eight Sleeper tracker is a great option if you don't mind its firmness and if its sensors don't bother you. If you want something that you don't have to attach to your bed you may want to look into the three different mattress options, the same company offers. Their Saturn mattress specifically, is a great smart mattress that features Eight's Smart Tech cover to accurately track your sleep. It uses responsive foam for added comfort—and you won't have to worry about adjusting how it fits your bed or where you place all your power chords and accessories. After searching the Eight website, and sifting through other sources, I found the Eight sleep tracker doesn't have any clinical trials that evaluate their level of accuracy—unlike the Oura Ring, Beddit, and Thim sleep trackers. However, many users report that they receive relatively accurate results and can see their progress over time. Before moving forward, it's important to note that this sleep tracker is probably more accurate when you sleep on your stomach since you will be closer to the sensors (this specifically applies to your breathing and heart rate during the night). Another great feature is the tracker's ability to track the sleep of two different people—but many of you may be wondering just how accurate those results may be. The king cover, specifically, tracks each side separately so that you will receive separate data for each side. Accuracy may depend on whether you both converge in the middle, what position you are in, etc. On the other hand, if you sleep alone, you may be wondering how accurate your readings will be if you are someone who ends up moving around all over the bed during the night. Unfortunately, if you do this you will find that the Eight Sleep tracker will still track the left and right side—so your night will be split depending on which side you are on. This is something the company is working to address since there are so many of us who end up tossing and turning during the night without realizing it. If you're an animal lover that shares the bed with your furry companion, then it's important to note that this Sleep Tracker isn't a great option for you. Having your pet in the bed might provide you with inaccurate results that you can't count on. So, unless you are willing to move your pet to a different area, I suggest you look at sleep trackers—like the Oura Ring, Dreem or Fitbit Charge 3-- that won't have this issue. All that being said, the Eight Sleep tracker will end up accounting for your routine over time, so the accuracy will improve and won't be affected by a restless sleeping partner the way it is with a pet. The Eight Sleep Tracker is on the pricier side—and if you don't need the additional features it has to offer, you'll find it's probably not worth the investment. If you want a sleep tracker that warms your bed and you don't mind paying extra for it, then this may be a great option for you. However, if you still want all the smart home features that are achieved via Amazon Echo integration, but are fine without the additional heating capabilities, then I recommend the BeautyRest Sleep Tracker. This one comes at a significantly lower price and is also able to track two people. On the other hand, if you want a non-wearable sleep tracker that you can take with you on the go and whenever you travel, then you may want to consider the Beddit, Withings Sleep, or Emfit QS sleep tracker. While they may not provide all the same features, all of these use the same sensor technology. In the end, these are all great sleep trackers to choose from—it just depends on what features you are looking for and not willing to comprise on. The Eight Sleep tracker comes with many beneficial features and the overall concept behind it is great—but it also has its downfalls. On the plus side, it can track two different people in the same bed and provides access to your heart rate, breathing, temperature, and ambient light during the night. The Eight sleep tracker also comes with a bed heating system that provides 10 different levels to choose from, has a timer that you can set to your preference, and is controlled from the Eight app. Many users also love the tracker's Smart Alarm, the app's additional features, and its smart home integration capability. While these are great features everyone should consider, the tracker does have some issues. Its biggest downfall is its unreliable connection—which affects everything and complicates the overall effectiveness of the tracker. If you are someone who loves to sleep with their pet, you will also be disappointed with the Eight sleep tracker since it won't accurately track your sleep with your pet in the bed. Overall, the tracker's app needs some upgrades, and the accuracy on this tracker is iffy since so many factors affect it. This tracker is also one of the more expensive options—so, if you want something more affordable (but similar), the BeautyRest Sleep Tracker is worth a look. On the other hand, if you want a 24/7 activity tracker, that also tracks your sleep, I recommend you take a look at the Oura ring. Alternately, if you are okay with spending more than you would on the Eight Sleep tracker, the Dreem band is worth a look since it also monitors your heart rate, movement, breathing, and brain activity— and you won't have to kick your pet out of bed with this one!